As a teacher, I am lucky enough to get the same days off as the students. With that said, having 10 days off during the holidays kept me wondering how I got through the chaos of it all while working. I’m guessing a nightly cocktail was involved. This year I decided to try and steal a little time for myself over winter break to work on a few neglected projects. The result: my desk is nearly finished (currently pricing power tools!! ), wardrobe has been downsized by two garbage bags & donated, crafting corner has been organized, and one of my heinous white apartment walls have been filled with one of my favorite projects thus far! Initially, I had different intentions for the frames but as I was strolling through Urban Outfitters one day a burst of inspiration took over. As I began the project, I intended to mirror the store version as best I could. 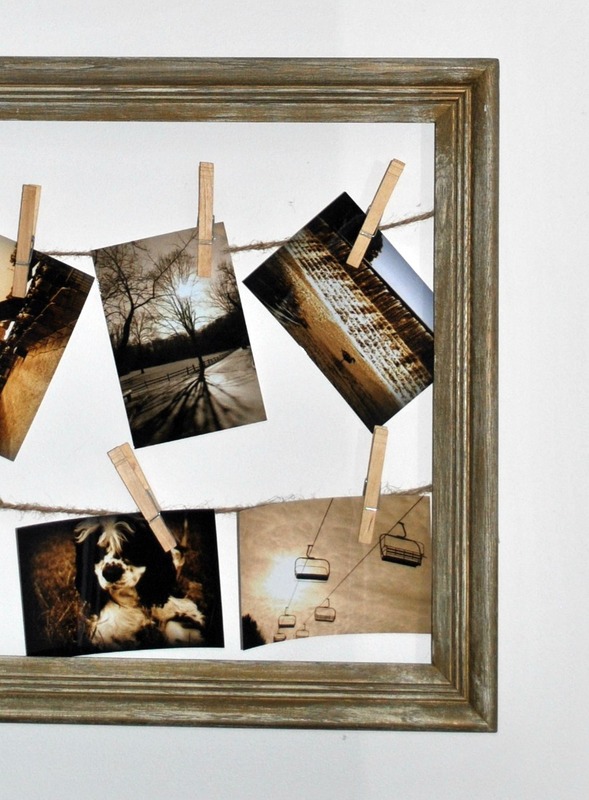 But as I started gathering supplies and photographs, I was continually reminded of the dark room from my high school photography class; processing our photos and hanging them to drip dry with clothes pins. I would often stare into the sea of photographs with admiration for my classmates work, other times with disgust for the lack of dedication shown, but most often with intrigue. Hanging would be a variety of photos with great quality and creativity, to others who over/underexposed photos, or left them out of focus/cut off, but overall each was hung with a sense of pride. I have always loved that room; it was beautifully chaotic, delivering inspiration and creativity out from every nook and cranny. 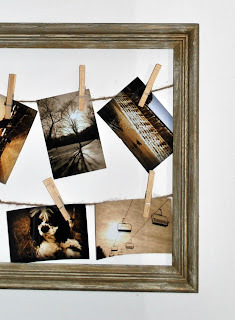 Paying homage to the class that influenced so much of my life is the project below: a combination of vintage frames, hipster store inspiration, and an undying love for the art of a student learning to process their own photos at every level. 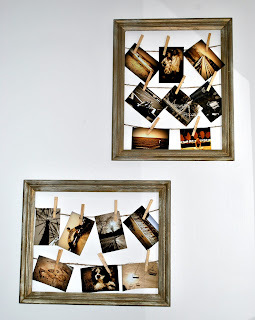 What a fun way to display pictures!